Winning Feeling! – Introducing this year’s top 3 from Berlin – Deutsche Neurowissenschaften-Olympiade e.V. 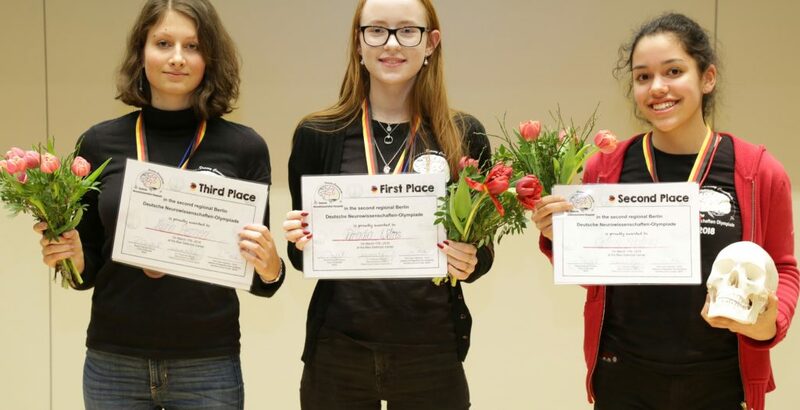 Certainly all participants of this year’s DNO regional event in Berlin did a great job and were very well prepared for the competition – but these three girls combined their knowledge with nerves of steel and thought their way up the ranks onto the podium. This year’s winner is Aradia, currently attending the 12th grade of the Berlin International School. Her fascination for the neurosciences is grounded in her curiosity to understand the way people make decisions and cope with the surrounding world. She believes this is mostly attributable to the way our brain functions, and cannot solely be explained by the analysis of the psych of patients. Her dream is to become a neurosurgeon, discovering the brains tiniest structures with her own hands. Celina scored second, wining a wonderful replica of a human skull and brain. She is attending the Schiller-Gymnasium in Berlin. Since she can recall, she had a certain knack for biology, especially on the molecular level of our world. She told us that she really enjoyed her day at the DNO event: “the team was there to have fun and showed us how enthusiastic they are about neuroscience”, which we take as a big compliment. Johanna is a ninth-semester med-student from Chrité Universitätsmedizin Berlin, Germany. She was introduced to DNO through a friend and fellow student in 2017. In this year she became part of DNO’s family and helped organizing the regional neuroscience competition in Berlin. As she has been fascinated by the neurosciences since she was a teenager, she is happy to support DNO’s cause and help students to share their passion. Copyright 2019 by Deutsche Neurowissenschaften-Olympiade e.V.